"The greatest jazz guitar player I ever heard is George Benson. He'll scare anybody to death in this world. But you see the stuff he plays? George Benson, wherever you are, come out of that stuff and play some Harold Arlen tunes and Duke tunes. George Benson's stepfather was into jazz, and it seemed that there were always some Charlie Parker records around the house, but there were also older items, like Charlie Christian's electric guitar riffing the light fantastic before taking off into the heavens on devilishly swinging Benny Goodman Sextet sides. Benson absorbed it all and--in 1951, when he was eight--took up the guitar. At first, it was not an instrument on which Benson figured he would base a career, but rather an adjunct to his real interest: singing. Winning a singing contest at the age of four had led to his making regular appearances on a local radio show, billed as "Little Georgie Benson--the kid from Gilmore Alley." Eventually, he combined the two talents, working with his cousin's vocal group and leading his own rhythm and blues bond in the Pittsburgh area. Benson's first real break came in 1961. "Jack McDuff was in Pittsburgh looking for a guitarist to work with him on a local gig," he told me 16 years later, "so I auditioned, and I ended up staying with him for three and a half years--it was a very good learning experience for me." McDuff played the electric organ, an instrument whose time had come in the sixties and helped open the door to the electronic sounds of the seventies. As a guitarist, Benson mainly looked to Charlie Christian and Wes Montgomery for inspiration. As fate would have it, two men who played major roles in the lives of these guitarists would also have influence on Benson's career. 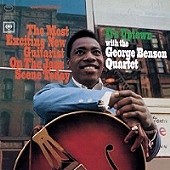 John Hammond was Columbia's Director of Talent Acquisition in 1964 when Benson's manager, Jimmy Boyd, invited him to hear the new George Benson Quartet. The group--with organist Lonnie Smith, baritone saxophonist Ronnie Cuber, and a drummer--was appearing at the Palm Tavern on Harlem's main thoroughfare, 125th Street. Twenty-five years earlier, a similar tip from pianist Mary Lou Williams resulted in Hammond bringing the unknown Charlie Christian to New York where he wowed critics and fans for two years, secured for himself a high place in jazz history, and tragically succumbed to TB. Hammond greeted the young Pittsburgh guitarist with equal enthusiasm. Columbia signed Benson and soon thereafter released his first album for the label (It's Uptown). It featured his working quartet and was well received by the jazz fans and critics who, dictated by the circumstances of his "discovery," made the inevitable comparison between Benson and Christian. "Eternally" [mp3]. But George Benson was at this point just as intrigued by Wes Montgomery's style. "I learned a great lesson from Wes Montgomery, one of the greatest musicians of our time-of any time," he said. Some jazz critics had lambasted Wes Montgomery and all but branded him a traitor for making "commercial" recordings with lush strings and burnished brass. When Montgomery died prematurely, his producer signed Benson--some say, as a replacement--and gave him similar treatment. It boosted Benson's acceptance by non-jazz audiences, but--from an artistic point of view--the recording experience was a nightmare. "I would go on the road and return to find that a record I had started had been finished with all kinds of additions and elements that I didn't necessarily approve of, and mixed in a way that I did not like," Benson recalled. "The strings would be dubbed on top of my guitar, making a sideman out of me on my own records." That all happened after 1966, when the present set was recorded. Benson's stay at Columbia was brief, but he was given the freedom to perform as he saw fit, so he was pleased with the result. "The Columbia records were the records of a very excited young player who was anxious to let people know who he was, and make an impression on the jazz world," he said in 1978. "I like those records very much, they represent a certain period of time for me. But sometimes I'm embarrassed by the contents of my solos." 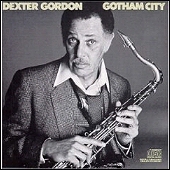 At the time of that interview, Benson was at the peak of his popularity, but not as a jazz artist. Although Montgomery's former producer had gained him wide acceptance, Benson took the first opportunity to go elsewhere, to a producer who was willing to let him do things his way. It paid off when he hit the jackpot with Breezin', a big pop album. The rest, as they say, is history, but no matter how commercial George Benson's music gets, there is always a very warm spot in his heart for jazz. Unfortunately, Benson doesn't get much of an opportunity to play the kind of straight-ahead jazz you hear in this set. But the enthusiasm is there, and the talent for it is still intact, perhaps even greater than before. "I think my musicianship has improved," he observed a few years ago. "I don't overplay anymore. I used to play excessively, I think--I liked to hear a lot of notes." This album contains a lot of notes, and they are well placed. Today, George Benson continues to brighten up the pop world, but he still takes time out for jazz--that other thing he does so well. The George Benson Cookbook, Columbia. A selected discography of George Benson albums. The New Boss Guitar, 1964, Prestige. The George Benson Cookbook, 1966, Columbia. Beyond The Blue Horizon, 1971, CTI.